Ahmed Joda was born in Girei in Adamawa State. experience in journalism while staying in Britain. 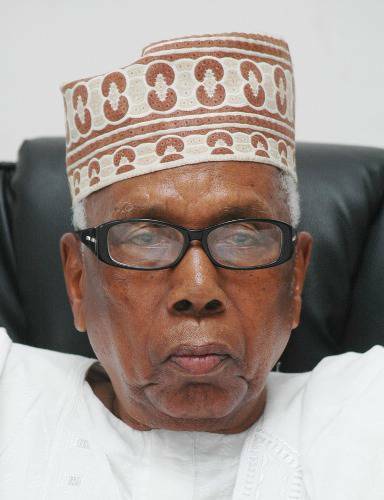 After completing his secondary education in 1948, Ahmed Joda was admitted to Moor Plantation, Ibadan. He worked briefly at an agricultural centre in Yola before entering the field of journalism at Gaskiya Corporation, Zaria. He later worked for the Nigerian Broadcasting Commission serving as the editor of NBC Kaduna and then joined the Northern Nigeria civil service as Chief Information Officer and later permanent secretary in the regional Ministry of Information. In 1967, he became a federal permanent secretary in the Ministry of Information and subsequently moved to Lagos. It is worthy to note that he was the chairman of the 18-member transition committee, nominated by General Muhammadu Buhari to receive the hand over notes from the Goodluck Jonathan led administration in 2015. Ahmed Joda is an administrator, journalist and politician. Also worthy of note is the fact that, he was the chairman of the transition committee in 1979 when General Obasanjo handed over to president Shagari. That handover was the military deciding on their own to handover power back to the civilians. They conducted the elections, accepted the outcome and decided to hand over and go and rest. There was no acrimony between incoming and the outgoing government because they were all polite and nice; it was smooth. when he was appointed chairman, the Obasanjo administration had set up a complete office, furnished it and equipped it together with committee and conference rooms. He had also appointed people from the civil service and from the private sector to serve as rapporteurs, resource persons and so on. All that was needed to do was to walk into these offices and start work; absolutely there was no problem. In 1999, he was on what Obasanjo called Presidential Policy Advisory Group under the chairmanship of General T.Y Danjuma and he was Number Two and the same thing happened. They had a complete office block already made, vehicles and buses and their accommodation had been booked and when they arrived everything was smooth, including all the handing over notes were prepared on the first day. the interview "We were all witnesses to the election campaigns, how bitter it was. There were predictions that the country would collapse; there were also all sorts of allegations and counter-allegations and the environment was very hostile. People were expecting the worst, but God, in His infinite mercies, diffused all the tension but, perhaps, the outgone government did not expect to lose the election, I don’t know. They lost the election and had to put up a brave face. I, as a person, I completely understood the difficult situation emotionally they were in but the meetings I had with both the SGF and Vice President Namadi Sambo were extremely friendly. They offered me all the cooperation and we discussed things as Nigerians. I personally decided that I was not going to enter into any controversy or make the situation worse. In any case, whatever they did or did not do would not likely affect the critical question of the change of government on May 29. And if they didn’t give us any information that information would be ours on that May 29. Therefore, I worked on this basis and I think our committee accepted that way of doing things instead of creating unnecessary additional tension to the political environment." He was a former permanent secretary in the Northern Nigerian public service, Federal Ministry of Information, Ministry of Education and the Federal Ministry of Industries. He was among a class of super permanent secretaries in the 1970s that played a major role during the Nigerian Civil War. In the 1960s, he worked with Ahmadu Bello in the Northern regional government. In 1999, he headed a committee on assessment of Federal Government parastatals and also a panel on poverty alleviation. He currently serves as the chairman of ABTI-American University of Nigeria, Yola and is the principal founder of Benue Valley Farms. After, the civil war, he was seconded to the Ministry of Education when the ministry was involved in rehabilitation of facilities in the old East Central State, launching of the Universal Primary Education and the establishment of the Nigerian Universities Commission. In the mid 1970s, he became permanent secretary in the Ministry of Industry at a time the Nigerian government was trying to launch a national steel programme. He has also served as chairman and board member of various bodies including the Nigerian National Petroleum Corporation, Nigerian Communications Commission, Pastoral Resolve, SCOA, Nigeria, Chagouri and Chagouri Construction, Flour Mills, Nigeria, and the Nigerian LNG.